Are you looking to lower your car without causing a decrease in performance? Coilover kits are a popular way to drop your car several inches while also increasing handling and responsiveness. Plus, lowering your car looks cool, too. Finding the right coilover kit can be confusing, but we’re here to keep you on track. We’ve listed the best coilover kits for 2019. Plus, our shopping guide explains what coilover kits are and how you can find the best one for your vehicle. Don’t worry, all the information is written in plain English which even beginners will be able to easily understand. What is a Coilover Kit? How Do Suspension Systems Work? How Low Can My Car Go? 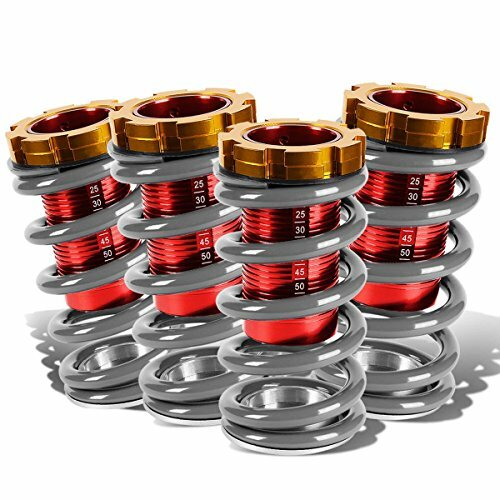 Can I Lower the Springs to Lower My Car? What are Full Bodies Coilovers? Can I Install Coilover Kits Myself? Coilover kits are the most popular type of suspension system. They’re made to lower your vehicle and improve handling. The term “coilover” is short for “coil over shock” — which is a suspicion system where the coiled springs go over the shock absorber. Suspension springs are made into coils because that shape allows for easy compression and retraction. Coilovers refer these to these coiled springs which go over the shocks. 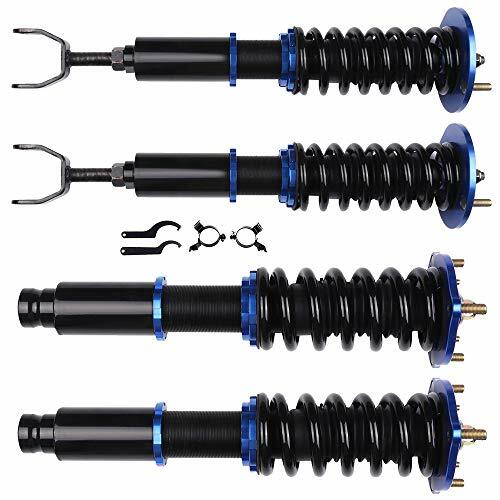 A coilover combines the vehicle’s shock absorber and coil spring. This connects the vehicle’s body to the wheels. Coilovers allow precise adjustments to both the spring height and the firmness of the shocks. Designed to work with any shocks, rims and tire combinations, this coilover sleeve kit provides a significant suspension upgrade for a variety of Hondas and Acuras. These coil sleeves allow you to adjust the ride height anywhere from one to four inches. Can be easily used with either stock or aftermarket shocks. Aside from increasing the height and control, these red sleeves add a bit of cool aggression to your vehicle’s style. Made from CNC precision-machined aircraft aluminum, these coils are built to last. A cold wound springs powder coating adds an extra layer of durability. Dual locking perches keep the coils in place even during rough rides. Compatible with a wide range of Hondas including the CRX, Civic, Del Sol and more. Also compatible with Acura Integras. Fits shocks up to 50mm in diameter. Featuring mono-tube shocks, this suspension kit allows for plenty of fine-tuning between a wide range of soft and stiff shock settings. The most interesting feature here are the mono-tube shocks, which provide a large capacity for gas and oil. Additionally, the mono-tubs have 32 clicks of valving. This allows for very precise adjustments between soft and stiff settings. Independent ride height is maintained by full-length adjustability. No matter how you adjust the height, the shocks will continue to absorb force, resulting in a smooth ride. 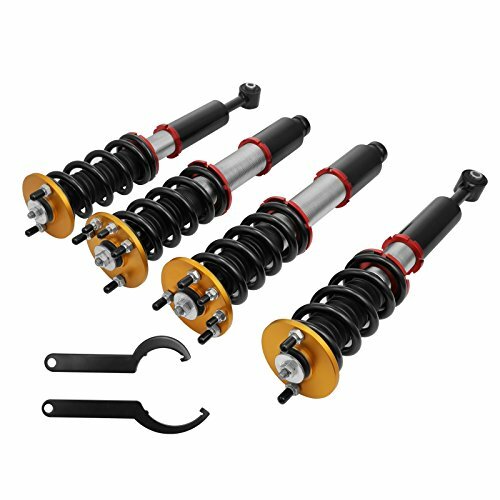 A high-quality set of coilovers which help reduce bounce and improve overall vehicle stability. 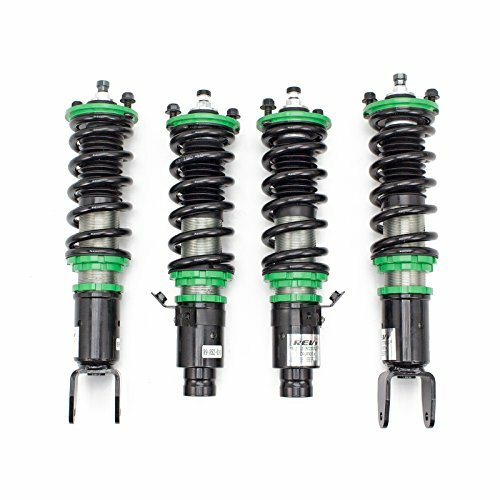 This a complete set of coilovers suitable for a wide variety of Honda Preludes. Works as an effective replacement for coil struts. Lowers the vehicle while also increasing stability, even for light cars in slick driving conditions. This is one of the few coilover kits which doesn’t specifically recommend professional installation. While you still need to know what you’re doing, you can install these yourself in your home garage. Looking to improve your car’s handling? This suspension coil set from Mophorn provides a smooth ride with increased handling and more responsive steering. Better performance on the road is the name of the game here. This full coil set includes two front pieces and two rear. Shocks are made from CNC machined steel while the shocks are made from aluminum. A fixed ring increases steering responsiveness, so you feel more in touch with the curves of the highway. Also includes dust boots to help protect the damper seal from dust and debris. A state-of-the-art mono-tube provides dramatically improved stability and vehicle control, perfect for both everyday driving and even professional racing. Increased vehicle stability and control is the main feature here. The Skunk2 Racing Pro-S II Coilovers feature adjustable heights, improved road grip and vehicle-specific valving. Designed for Honda Civics and Acura Integras. This kit is designed for at-home installation. Package includes four springs. This complete kit allows for precise height adjustment while also improving steering performance and reducing braking distance. This complete kit includes two front pieces and two rear. Struts can be lowered independently which allows for precision height changes. An adjustable camber plate and preload spring tension help moderate bouncing and increase overall ride comfort. At the same time, the lowered height will make you feel more in tune with the road when you’re behind the wheel. Made with durable aluminum upper mounts, these coilovers from Yonaka allow a wide range of height adjustments. These coilovers allow for a wide range of height adjustments – and no changing of the spring compression is required. The suspension travel doesn’t have to shortened, either, due to threading in the bottom of the shock absorbers. This coilover kit includes all-aluminum upper mounts which allow height adjustment between three and four inches. An inner bump stop prevents rapid concussion impacts while a rubber dust shield protects the piston. To best understand the benefits of a coilover kit, let’s first take a look at how suspension systems work. Your suspension system controls your tire’s contact with the road. The point of upgrading your suspension is to lower your vehicle, which increases that contact. Shop for a suspension system like you’re Goldilocks shopping for a bed. If your vehicle’s suspension is too soft, traction and performance will be negatively affected. This is because the tires will have reduced contact with the road during cornering due to weight transitions. However, a suspension system which is too hard will cause problems, too. If the suspension is too stiff, the car can slide out of your control. A stiff suspension prevents the tire from making the proper amount of contact with the road. Coilover kits are adjustable, which helps prevent these problems. The car can be lowered to the desired height without causing the suspension to be too soft or stiff. How a coilover system is adjusted depends on how it’s made. There are two basic types. First, some types of coilovers are adjusted by turning a spring perch to compress the spring itself. This lowers the vehicle, but there’s an issue: a pre-load is applied to the springs. That will reduce handling – in some cases, significantly so. The second type of coilover is usually the better choice. Here, the actual shock is threaded. So, when you expand or compress the spring, the length of the shock also changes. With this type of coilover, spring compression is unaffected. The vehicle’s height and the stiffness of the shocks can both be adjusting without requiring the removal or disassembly of the existing struts. Adjustment is easier and handling is improved. These are the budget-friendly option. They’ll work with your existing stock struts. However, don’t expect significant improvements to handling. 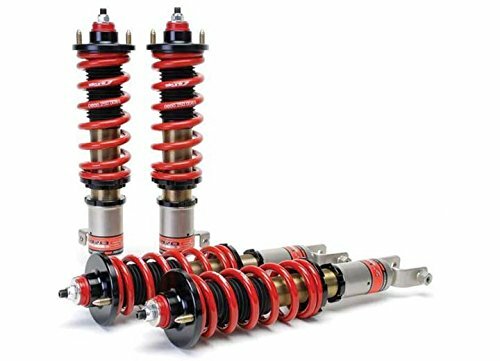 These coilovers have an adjustable lower-spring holder which lowers the ride by compressing the coil spring. Generally, these are both inexpensive and easy to install. If you want additional flexibility, some models also include an outboard shock absorber oil reservoir. This is mainly used to make performance-related adjustments during competition. As the name implies, these coilovers are designed for off-road racing. They allow for a wide range of height and firmness adjustments. Plus, they allow for extra-long shock travel, perfect for bouncing over rugged terrain. Specifics will vary based on the type of coilover you use and the type of vehicle you have. Most coilovers will lower the vehicle about half an inch even at the highest setting. However, you’ll probably be able to lower the vehicle another three to four inches if you like. Most cars can only be lowered two inches before driving issues start to occur. However, sometimes cars are lowed beyond normal drivability for displays or car shows. Additionally, some coilovers will actually raise your vehicle. These will clearly be labeled as off-road coilovers. They’re typically used for rally cross, Baja racing, four-wheeling and similar activities. You can, although it’s not usually the best option. Basically, you can simply replace your existing stock springs with replacements which are anywhere from a half inch to two-and-half inches shorter. Typically, you’ll also want to replace stock shocks with high-performance ones, or else the new springs can make the ride pretty rocky. Adding shorter springs will lower your ride. But the height won’t be adjustable, handling can be pretty stiff and the cost can be high. This refers to a complete kit which includes shocks. Might also contain top mounts. The main benefit here is completeness. The shocks are specifically designed to handle the demands of the lowered car, which will have higher spring rates. On the downside, these complete sets are the most expensive option. 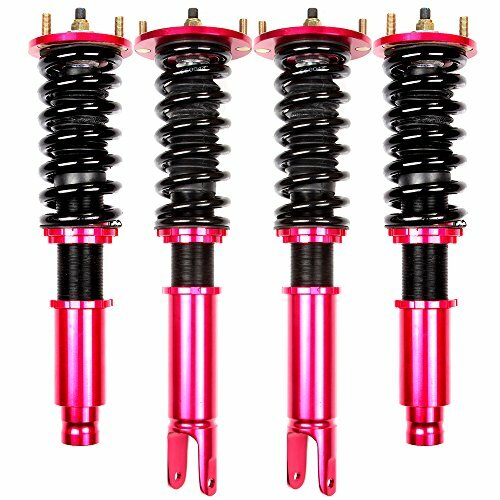 These coilovers don’t include shocks, which does lower their price pretty substantially. While they will lower your car, there are some drawbacks. Most stock shocks aren’t always designed to work on lowered vehicles. Adding coilovers without upgrading your shocks typically only results in limited improvements to handling. However, sleeve coilovers can work great with a select few types of vehicles. The Mitsubishi Lancer EVO, Subaru WRX STi and certain other vehicles have factory-installed performance stocks. 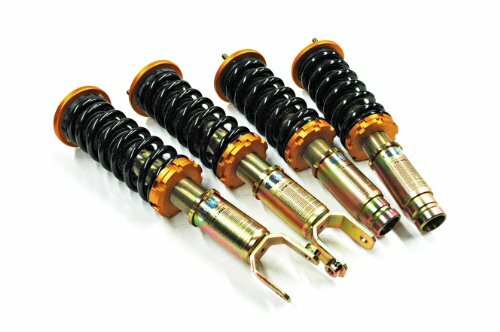 These shocks will normally work well with sleeve coilovers to improve handling for lowered cars. Possibly. If you’re comfortable working on your own car, installing a coilover is usually a job you can handle yourself. However, know that it’s time-consuming and can be a lot of work. You’ll need to remove all the tires and lift the car up. Plus, if you’re installing a kit, you’ll need to install not just the coilovers but also the shocks. While installation isn’t terribly difficult, adjusting the various settings such as the height and firmness of the shocks does require some technical understanding. As discussed above, shocks which are too soft or too firm can affect car control and performance. Additionally, calibrating your coilovers will typically require some test runs. You’ll want to cover different types of terrain and compare how the shocks feel. Testing should also cover the springs. Generally, springs should be as light as possible while remaining strong enough to support the vehicle. The bottom line is you can install coilovers yourself if you’re comfortable working with cars, especially working around the suspension system. However, if you’re new to coilovers, you’ll get far better results with professional installation. Excited to add a coilover kit to your car? Improved handling and responsiveness can be yours, whether you’re racing at a track or just want better performance on your daily drive. Plus, coilovers allow you to adjust the height of your vehicle without putting unnecessary strain on your shocks. Overall, coilover kits are more than just useful – they’re also a fun way to increase the cool factor of any car!